Timothy Franz Geithner (pronounced /ˈɡaɪtnər/; born August 18, 1961), was the 75th United States Secretary of the Treasury from 2009 to 2013. He served under President Barack Obama. Before becoming Secretary of the Treasury, he was president of the Federal Reserve Bank of New York. 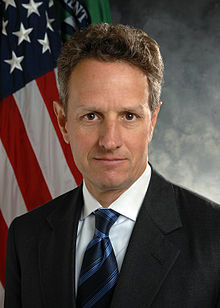 Geithner was born in Brooklyn, New York. ↑ Raum, Tom (October 18, 2008). "Next treasury boss will feel power - and stress". USA Today. Retrieved January 27, 2013. ↑ "President-elect Obama Announces Top Economic Advisers". This page was last changed on 31 August 2017, at 13:38.